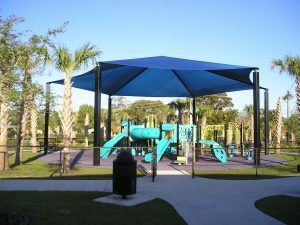 Hexagon and octagon shades are a visually-pleasing way to lower the temperature and protect children in your play area. 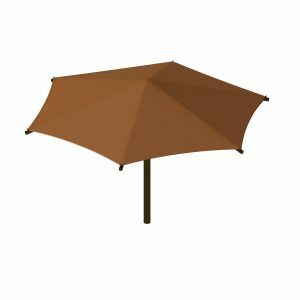 We sell 2 types of hexagon and octagon shades: hip roof designs with exterior posts, or umbrella designs with a single post (either at the center or suspending the canopy from above). Hip roof hexagon and octagon shades are great for picnic and seating areas because they cast a long, wide shadow. They’re also popular for use over sandboxes and other areas where smaller kids play. 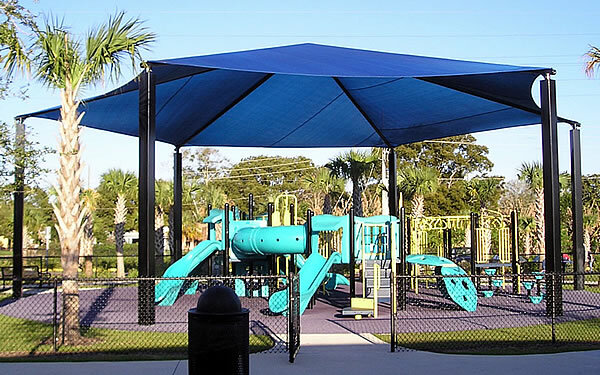 And thanks to the strength of the exterior vertical posts, hexagon and octagon shades are available in taller models, too, for covering entire playground structures. With 6 or 8 vertical posts, they can stretch across large playgrounds at great heights. The manufacturer designs these shades to industrial strength, so they’ll stand up in winds up to 80 mph. (The shades’ steel structures are rated up to 150 mph.) On every shade, the fabric can be removed for winter storage using a patented easy, quick-release system. 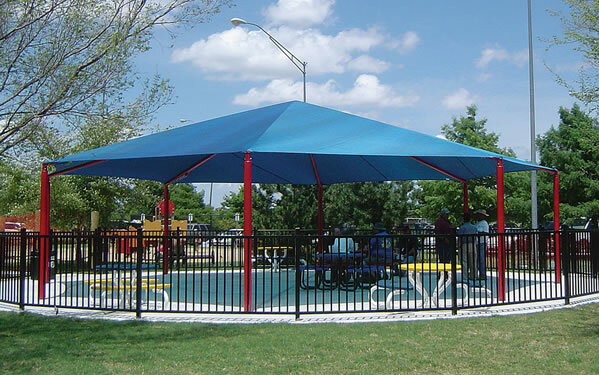 As the sun grows stronger, so does the usefulness of our playground shade structures. 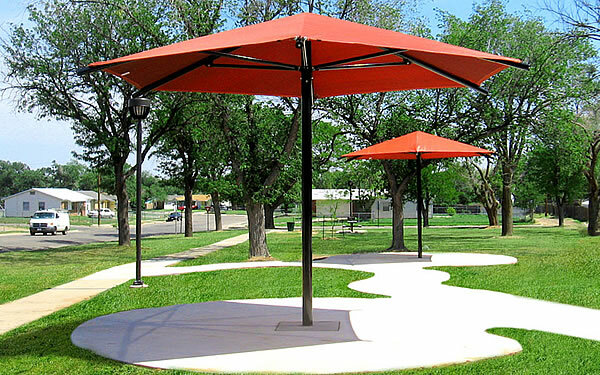 The sturdy center-post design of these umbrella shades gives them the strength and tension to handle canopies ranging from 10′ x 10′ up to 27′ x 27′. They’re great for larger projects requiring a large wing-spread of a single canopy. 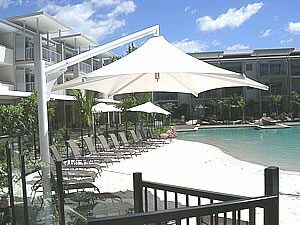 For smaller projects, our cantilevered umbrella shades are available in hexagon and octagon designs. A “cantilevered” design simply means that the shade structure suspends the canopy from above. • More attractive play areas — add color and visual themes to your outdoor space. 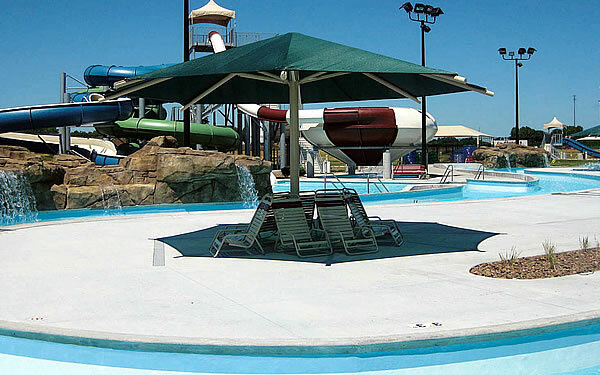 Many different colors are available for both the metal support structure and the shade canopies. For more information, just phone us today toll-free!